Lake Placid Travel: Search Results. 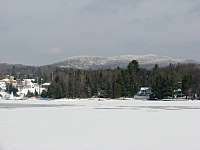 10 listings in Lake Placid Travel. 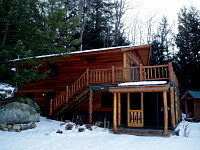 Long lake Real Estate Inc.
We offer some of the best weekly rentals in the Adirondacks. We have waterfront cottages & homes with many ammenities! Long Lake is the geographic center of the Adirondacks and has several restaurants, many stores, and great outdoor activities, ranging from boating, hiking, skiing, camping, fishing, and many others. 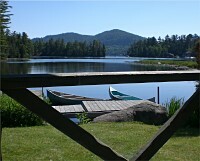 Long Lake Real Estate also has many great properties for sale both on and off the water!! Rent the wonderful cottage shown above for only $1650 a week! "Meticulously Maintained" AAA-rated. In village. Restaurants within walking distance. Golf & ski packages available. Choose from 1 double, 2 doubles, king, 2 bedroom suite, apt kitchenette with gas fireplace, Eff kitchenettes or pamper yourself in one of our beautiful new jacuzzi suites. Cable, HBO, TV with a remote, A/C, telephone with free local calls. Coffeemaker, frig, alarm clock & hairdryer. Outdoor pool & charcoal grills. Children under 10 stay free. Sorry no pets are allowed in our rooms at anytimes. 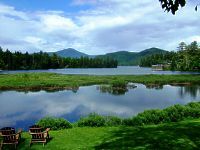 Mirror Lake Inn Resort & Spa is Lake Placid's finest and only AAA Four Diamond Resort on the lakeshore. The Inn provides a personalized experience for the mind body and palate. Enjoy fine dining in The View Restaurant or casual fare in Taste Bistro. Coctails and lighter fare can be found at 'Lake Placid's meeting place', The Cottage Cafe. 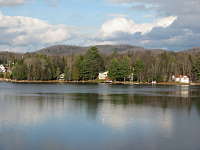 Private Beach and docks located on Beautiful Old Forge Lake. Motel and cabins located in Village. Free wireless internet, cable. Some cabins with fireplaces. Some eff. kitchenettes, Seasonal rentals, ride your snowmobile right from your room onto the snowmobile trails. This picturesque Inn and cottages is located right on the shores of Lake Placid, and in the resort village of Lake Placid, a short walk to downtown. 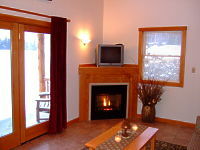 Adirondack ambiance surrounds you in our comfortably appointed rooms, kitchenettes, suits and cottages all with: free WiFi, full bath/shower, cable TV, self-control heat or air, and phones with free local calls. We have free canoes, picnic tables, outdoor pool, Adirondack chairs for lounging by the Lake, all having a magnificant view of the Lake and Whiteface mountain. The Inn has been owned and operated by our family for 30 years, and we are dedicated to giving you great service with clean comfortable accommodations! We offer a variety of wonderful packages: Dinner Romance, Roses and Sparking Wine, Chocolate Decadence, Oh How Romantic- Picnic Basket, Golf, Olympic Passport, and Downhill/Cross Country Ski Packages. For details on a great vacation getaway and/or reservations click on the links above. Offering luncheon, dinner, Sunday champagne brunch cruises and scenic excursions from June through October. Breathtaking scenery, delectable food, fascinating history, hospitable welcome. Group packages, private charters, gift certificates available. Take the Gilded Age Heritage Tour. 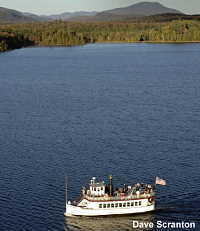 In one day visit The Adirondack Museum and Great Camp Sagamore and finish your day with a relaxing cruise on Raquette Lake. We are a full service specialty retailer of better sportswear and skiwear for women and men.� We specialize in matching your needs with the offerings of our numerous brands.� Ruthie�s Run stocks a large selection of Norwegian wool sweaters, as well as cotton, cashmere, and novelty sweaters. We have great sporty jackets, versatile vests, and dressier blazers; unique knit tops, beautiful woven blouses, fun flirty skirts and dresses for play or parties; great fitting pants from jeans to classic work pants; European outerwear for men and women; and American made fur, shearling and microtech coats, jackets, and parkas. Ruthie�s Run has jewelry, charms, watches, handbags, wallets, incredibly soft wool blankets from Norway, and many more accessories - from head to toe: from hats, novelty silk ties and scarves, to shoes, slippers, and apr�s ski boots. We also rent tuxedos for your special occasion. In village location with lake and mountain views. A/C, Cable TV, Phones and refrigerators in all rooms. King, Queen and Double beds. Cottage and apartment with kitchen and fireplace. Outdoor pool (summer only). Close to all Olympic Sites, restaurants and shopping. Golf, Ski and Olympic Tour Packages. Children under 10 stay free. Free coffee and donuts (high peak season, winter on weekends). Picnic area with gas grill. Free use of bikes. No pets please. Mobil Guide rated. Rates from $59.00 - $190.00 depending on season and choice of accommodation. 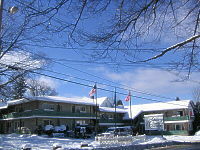 Wildwood on the Lake is located in the Village on the peaceful shore of Lake Placid. Operated by the Weber Family for 35 years we offer year-round accommodations. Most units enjoy a Lakeview from the patio or balcony. Summer guests are provided with free rowboats, paddleboats, canoes & kayaks. Our lakefront lawn has Barbeque and picnic areas. Our Outdoor Lake-fed, sand bottom pool is always a hit with the Kids. In addition enjoy our indoor heated pool, whirlpool and sauna. All of our units are Non-Smoking. Within The Village, dining, shopping and night time entertainment is only a stroll away.